The Bowling Green Hot Rods were 1-5 on the week with one game rained out against Lansing. They are currently in last place of the Midwest League Eastern Division with a 12-25 record, 12 1/2 games out of first and 2 games behind the closest team West Michigan. 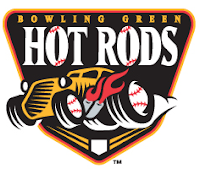 The Hot Rods continue to struggle, sitting near the bottom of all the offensive categories and have been outscored 160-117 on the season. Transactions: Mark Thomas activated from disabled list (5/13/10). Shane Dyer promoted to Charlotte (5/14/10). Gabe Cohen transferred to extended spring training (5/15/10). Brett Nommensen activated from disabled list (5/15/10). Eli Sonoqui activated from disabled list (5/18/10). Disabled List: Wood Fines, Tyree Hayes and Will Kline. The Week Ahead: 5/19/10-5/20/10: at Great Lakes Loons (23-15). 5/21/10-5/24/10: at Dayton Dragons (18-20). 5/25/10: vs South Bend Silver Hawks (17-25). There is no other propsects other than the ones shown here for bowling green? The Prospect Watch is simply the top 15 hitters and pitchers as selected by the panel prior to the start of the season. It is not meant to indicate that there are not any other prospects on a club. On a personal note, one of the stars on the club in my opinion is Chris Murrill who did not make the top 15 but is making an impact on the team this season. Oh ok I understand now. did Chris do good last year to? Murrill was picked in the 35th round last June. After he signed he played for the Hudson Valley Renegades. He hit .306/.360/.363 in 193 AB's, with 7 2bs, 2 3bs, 0 Hrs. Stole 29 bases, caught 7 times. Biggest improvement to me is with more BB's and less SO's. In 2009, in 215 plate appearances, he walked 13 times and struck out 46 times. In 2010, in 147 plate appearances, he's walked 13 times and struck out 25 times. So same walks in less PA's, lower SO rate, but still no power, although his SLG is up from .363 to .397. How about Mark Thomas~catcher~great arm~hitting really well~is he considered a prospect?